International Font Studio Dalton Maag have just released a new typeface called Aktiv Grotesk, designed to replace what their Managing Director and Type Designer Bruno Maag considers to be a 'poorly crafted and overused' design atrocity, namely Helvetica - the world's most popular typeface. The new typeface borrows from Helvetica and also from its more erudite cousin, Univers, (itself a re-imagining of Akzidenz Grotesk, created back in the late 1890's). 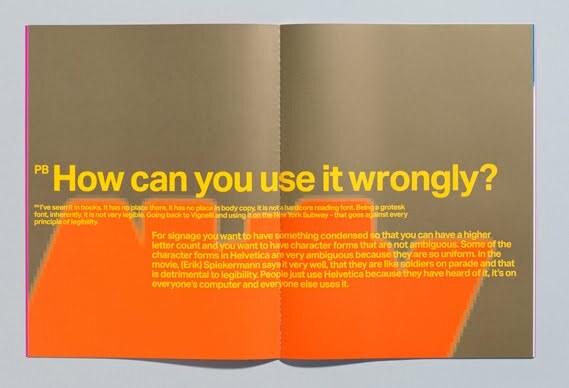 Maag sees the rise of Helvetica as 'accidental', and cites the big budget backing of Helvetica's Foundry, Linotype, and its overuse during the American advertising scene of the 1960's as the key perpetrators. 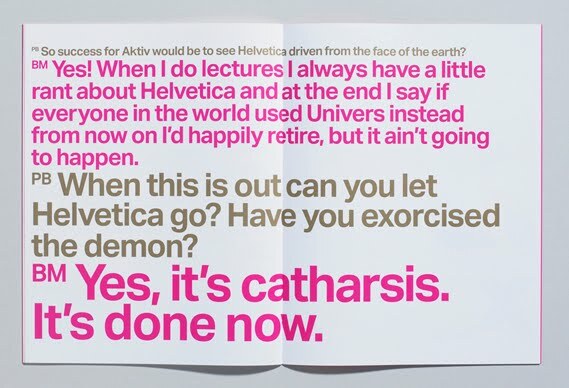 He also compares Helvetica to Julia Roberts and Vanilla Ice Cream, and has time to criticise Gary Hustwit's film 'Helvetica', in which he is 'galled' to hear none other than Massimo Vignelli describe Helvetica as a 'Modernist Typeface'. Maag is clearly a purist, and he knows his stuff, but it's all in the name of commerce, and one hopes it's mostly ironic. Everything that makes its way into the mainstream is always a diluted form of some superior original. Maag admits this but insists that it shouldn't have happened to Typography. But designers are still in love with Helvetica because it works so well. The shapes, lines and proportions come without the shackles of an inflection or a style. Helvetica is ubiquitous and commercial, and that's why it's as happy in a car saleroom or on a pizza box as it is on the front cover of Vogue or in an experimental double-page spread about some exhibition at Tate Modern. In fact, to continue with Maag's analogies, if Helvetica was an actor, it would use the Method - formally trained, hugely versatile, sometimes phoning it in, occasionally sensational, and always imbued with a reliable quality that does what you ask it to do. So now we know. Helvetica is actually Johnny Depp. Or Vodka.